Celebrate the season with new meaning! There is something powerful about the holiday season and gift giving. View this site the advent conspiracy and see if you agree! Clutter free holiday gifts are a great way to share experiences, not stuff. At this time of year we can teach our children about sharing by how we give gifts. We can unburden others by sharing in a new way. 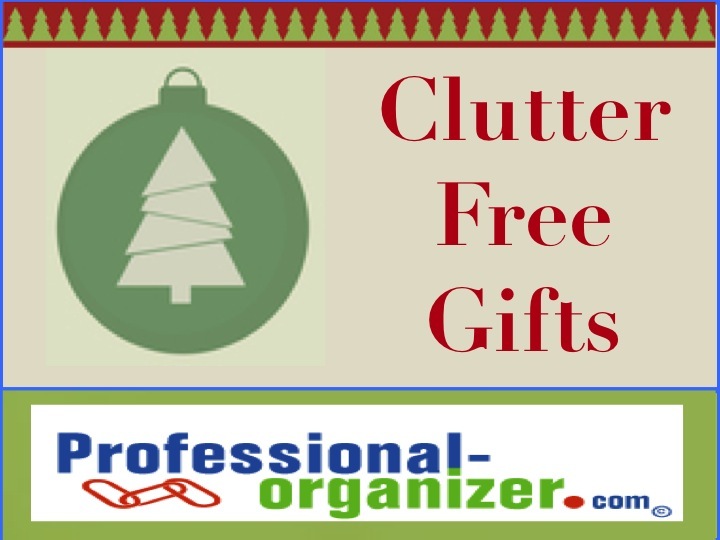 Clutter free gifts can include savings bonds, gift cards for gas or groceries, spa and pampering gifts, museum membership, entertainment tickets to local symphony or Broadway show, movie and a dinner, cooking, fishing or painting lessons, itunes or Starbucks gift cards, or any item that is consumable. Non-profit gift giving is an alternative too! Give the gift your friend is passionate about by supporting a worthy cause. Consider a cash donation to a charity in honor of the recipient such as cancer research, green living, or supporting underprivileged families. You can find these by reviewing www.charitynavigator.org. A gift always means more when you give the gift of yourself. Join a friend at an art class, yoga session, book club, or a scrapbooking class. Babysit for friends, nieces, nephews and grandchildren. Take a child to lunch, on a day trip, to the museum/zoo, or to a sports event. You can also make coupon book for those special and every day treats with things you know your partner would enjoy from the practical to the whimsical, such as a back rub, doing the dishes for a week, making a candlelight dinner, grocery shopping or packing a picnic. Other ideas for sharing the fun include a pirate swap or “Secret Santa”. The pirate swap is passing out numbers from 1 to whatever for the number of people at the event. Number 1 picks a wrapped gift, number 2 can pick a gift or steal the unwrapped one from Number 1. With the Secret Santa you pick a name from a hat with all the adults in your family establishing a limit for the gift’s expense. Gifts can be goofy, practical, or holiday themed. One client hosts her swap just like Oprah’s Favorite Things show. Guests bring their “favorite” beauty item including lip gloss, face cream or other product and have a swap. Virtual gifts are easy to make too! Create a family cookbook and give it on a flash drive to family members. Our family created a family cookbook last year to share within our family and with family friends. We use it constantly during the year to find frequently made foods. There are also many online scrapbooks to create with family photos as well. Check out http://www.smilebox.com/scrapbooks.html. Family photos can be shared and cherished in a new way this way. Keep the meaning in your holiday this year. It is not about the perfect gift, it is about connecting with those who are dear. Where are you on the clutter free continuum? Start something new this holiday with clutter free gifts. Join the holiday fun on my Facebook page. It here already! The holiday fun has started! With a myriad of activities, events, and tasks, the best way to approach the holidays is with a holiday time line. Start with a family meeting to talk about all the special parts of the holiday season. What makes the holiday special for each family member? Make a list of the most important part of the the holidays for each person. Now you know what your goals are for the season. Using a big month at a glance calendar, pencil in all the dates from your family meeting. These are the items to work around as you create your holiday time line. Add the tasks and times to get the “other stuff” complete. Gift giving: dates for purchases completed, wrapping, mailing. With a list, this can be completed before December 15. Tree trimming: dates for setting up the tree, outdoor lights, indoor decor. With organization and help, this can be completed by December 8. Holiday events: dates for cookie exchange, parties, family gatherings. Review your calendar each day to be sure what you need for each event. Work back two days to prepare for each event. All of this together means a less stressed holiday! You enjoy what is most important by pacing the actvities. How does your holiday time line work? It’s all about the food at this time of year! 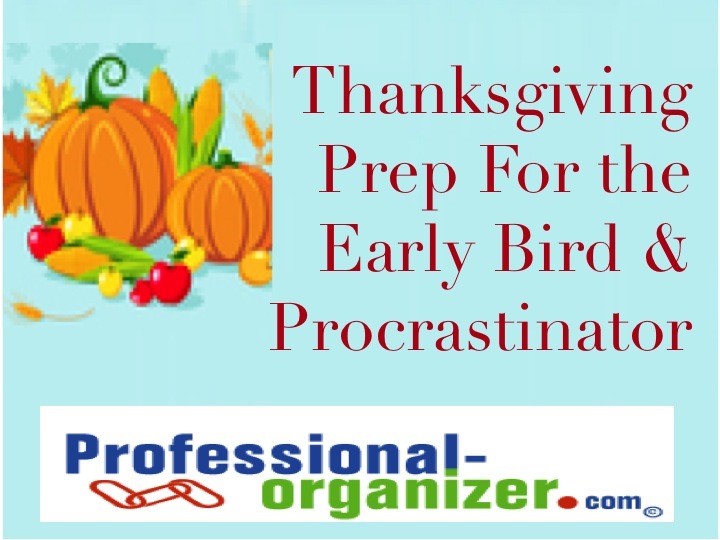 And getting your Thanksgiving dinner together takes planning and organizing. Some of us start our plans in early November and some of us start…well…not too early! Getting the menu together early is a good first step! Our family continues the tradition of turkey, bread dressing, mashed potatoes and pie. However, your family may be more adventurous! Recipes can be found online at www.allrecipes.com, in magazines like Southern Living, or just on the can of French fried onion rings! Deciding on your menu early means you can take advantage of sales throughout the month using your list of ingredients. Early invitations for guests really make them feel special. An early invitation also means you can ask your guests to bring a dish to share at your meal. New cuisine and added camaraderie make the meal more fun too! Getting ready for Thanksgiving also includes getting your home ready for company. Starting early is a good way to take baby steps in decluttering and decorating for the holiday. You can work room by room, decluttering and cleaning for several weeks. Your family will enjoy the holiday atmosphere and you will feel less pressured by time. Instead of turkey (which takes days to thaw), choose cornish game hens or ham. Both are easy to prepare. Ham can be purchased that day and heated. Choose to shop at a one stop location. It is easier to purchase it all at one retailer, rather than running between stores. Choose your store by the sales items on your grocery list. It’s not about perfect or made from scratch! Check out ways to use convenience foods in preparing your meal. Sandra Lee of FoodTV fame www.foodnetwork.com uses ready prepared items for making your meal special. Ask your family what treats and sweets are most important to them. You can purchase ready made desserts at a reduced cost at holiday time. Check out the options for pre-made Thanksgiving dinners. In Houston we have choices like Luby’s and Randalls. It all comes nicely prepared and ready to eat. Dine out! Just google Thanksgiving Houston and you will find loads of choices! What are your favorite Thanksgiving hints for your family dinner? No matter your style, wishing you a moist turkey and a sweet pumpkin pie for your holiday event!